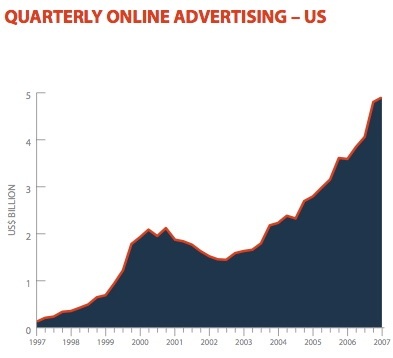 Is 2010 the Year Digital Will Eclipse Print Ad Spending? Spending on digital advertising is poised to surpass print for the first time in 2010, according to a new study prepared even before the announcement of Apple’s iPad, with all of its media game-changing potential. But another view is — So what? It’s bound to happen, sometime soon if not this year. Out of their collective $368 billion budget for 2010, Outsell expects advertisers to spend 32.5 percent on digital advertisements, and only 30.3 percent on print — the first time digital would outsell print, and likely the last time the two sectors would cross paths unless some sort of cataclysmic event intervenes. The $1,295 Outsell study (press release via Forbes) examined spending habits of 1,008 advertisers in December 2009, finding that online-ad spending will increase 9.6 percent in 2010. while overall marketing and advertising will increase too — but only by 1.2 percent. The news is also somewhat good for print magazines, which the study says will see ad spending increase 1.9 percent. But Ad Age digital lead editor Michael Learmonth told Wired.com that while Outsell is creditable, the tipping point is inevitable — when digital overtakes print, he says, is less important than the fact that it is happening or will happen soon. The digital-advertising category includes not only online publications but video, search engine keywords and e-mail. It’s seeming inexorability is based on the migration of people from print to digital services — from the New York Times to nytimes.com, by way of illustration — and it appears this could be the year when it takes place. Outsell gathered its data in December 2009 — the month before Steve Jobs announced the Apple iPad, a device that could impact both print and digital advertising, because one of its main points is to offer advertisers a format that combines the scale and intimacy of a magazine or newspaper with dynamic, interactive elements of digital publications. So, which is the iPad — print or digital? The study’s lead author, Chuck Richard, told Wired.com that the next time Outsell gathers this data, it will classify the iPad as “digital.” If advertisers had factored iPad spending into account, the scale almost certainly would have tipped even further in the direction of digital advertising. If you would like to learn more about how to effectively manage your online spending, please contact the SEO Consultant Firm today. some companies already charge more for better service, and i am a believer you get what you pay for. And if they are better, more people will go to the better company, forcing the competitors to step up there services. Nice useful information, keep more useful information. It’s a good topic.I would like to read more about your articles.Thanks.